Ashigara　足柄 is a famous mountain area near Odawara. The Ashigara Checkpoint at Hakone-juku on the historical Tōkaidō marks the beginning of Japan's Kantō region. Since the Edo period, Ashigara Checkpoint has been renamed Hakone Checkpoint. It is famous for the legend of Kintaroo, the Golden Boy 金太郎. 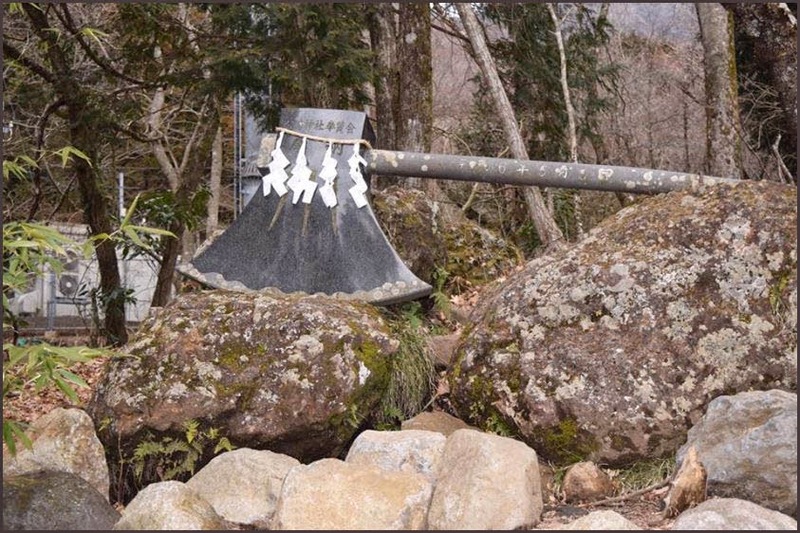 there lived at Jizodo (a place name) a rich person called "Shiman-choja". He had a daughter. She was very beautiful, and a woman of great strength of character. At that time、there also lived in today's Kaisei Town a powerful and influential Samurai (warrior) called Mr. Sakata. Mr. Sakata loved the daughter and decided to get married with her. Since her family was very rich, her wedding parade was luxurious and gorgeous, carrying trousseaus and gifts to her new family. Unfortunately, for certain reasons, she was forced to go back to her native house at Jizodo, when she was pregnant. Soon after she got home, she had a rotund and bouncing baby boy. She named him "Kintaro". "Shiman-choja" family took very good care of "Kintaro". "Kintaro" was a good, charming boy with clear eyes and rosy-cheeks. Strong and active boy from the beginning, Kintaro played as jumping up and down "Kabuto-ishi" rock and "Taiko-ishi" rock in the nearby rice field. As he trained himself in the mountains, he became so strong that he could throw a bear, the strongest in the mountain forests, in "Sumo" wrestling. Kintaro changed his name to "Kintoki" after grown up into a man. He became a big, strong and handsome young man, having a good reputation among surrounding villages. Around that time, there lived in Kyoto, the capital, the strongest chief "Samurai" (warrior) called Yorimitsu Minamoto. He happened to come across to Ashigara pass area on his way back from eastern countries. When he and his troop of retainers came to Jizodo, they took a rest, and were surprised to find out Kintaro, a strong and good-looking young man in such a countryside. Yorimitsu thought, "It must be by God's providence that I have met with this boy." and recommend him to become his retainer. Kintoki was extremely happy and, no doubt, accepted Yorimitsu's offer to become a retainer of the most famous Samurai in Kyoto. Mr. Kintoki Sakata went up to Kyoto, studied harder, and trained himself in martial arts to become one of the four Yorimitsu's strongest retainers. 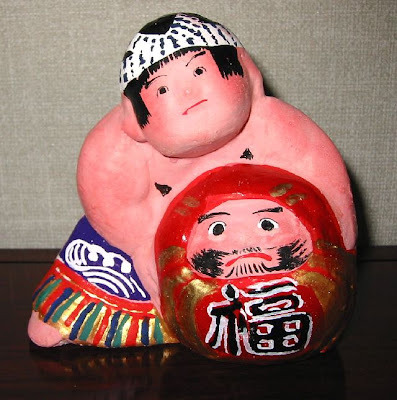 Even now, when a boy is born, parents decorate his room with "Kintaro" doll on May 5 (Boy's day: By the way, March 3 is Girl's day), expecting that he will have similar good luck to become "strong and gentle" Kintaro. 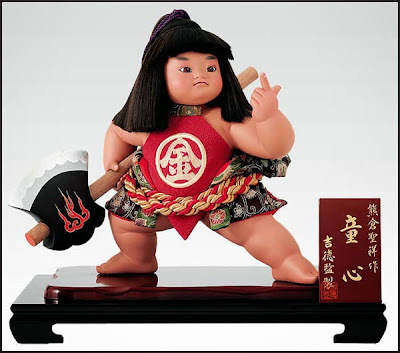 CLICK for more Kintaro dolls !
. Daruma and Kintaro だるま抱き金太郎 . ***** Mountain, peak, hill (yama, gake, oka) Japan Worldwide.